Harper's Weekly was an illustrated newspaper published during the Civil War. The paper was distributed across the country, and was read by millions of Americans. These newspapers contained incredible illustrations and reports of the war. 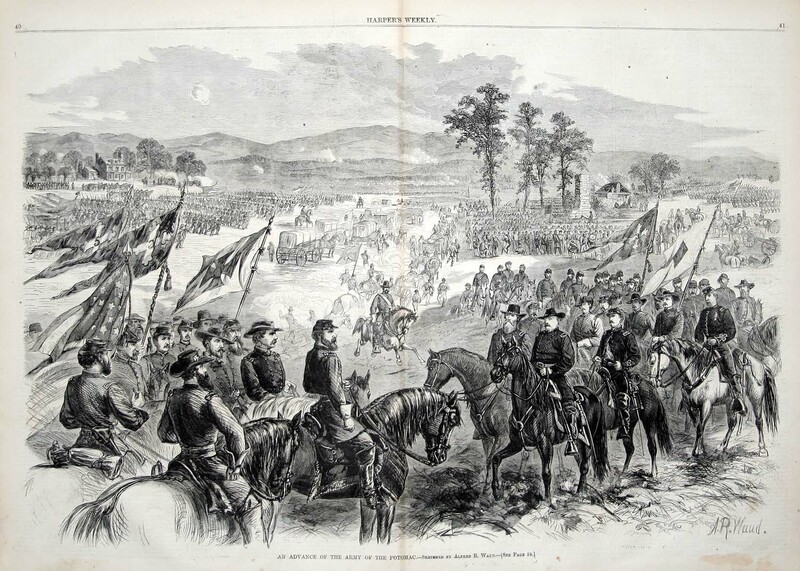 You are viewing an original 1864 drawing of the Army of the Potomac. The illustration is captioned, " An Advance of the Army of the Potomac. - Sketched by Alfred R. Waud. - [See Page 39]". The picture shows a number of officers on horseback, and a number of battle flags. Troops are seen marching in the background. A wagon train is pictured as well. In the front is Meade; near him are Generals Sykes, Humphreys, and Pleasanton, with Chief-Engineer Duane. The whole picture, though representing but a single moment of action, gives a great image of this army going into battle.